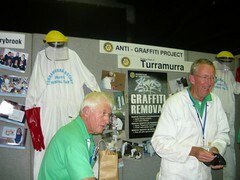 Increasingly Clubs are following the lead of the Rotary Club of Turramurra in establishing a local graffiti removal project. Experience has shown that rapid removal of graffiti is the most powerful deterrent to "graffiti artists". There is plenty of help on hand for Clubs wishing to engage in this excellent hands-on project.